Join the discussion on our forums! Come discuss Jade Behemoth over in our dedicated Jade Behemoth discussion topic. I think we should talk about the jade elephant in the room. Again, voting on this card is wrong. The deck doesn't exist without this card, and you can pretty reliably get a 3/3 or 4/4 with this card during the mid-portions of the game. In late game, you're getting 6/6 or 8/8 with it, and your health might be low, so the taunt is useful. By turn 6 you should be spawning at least some 4/4 jade golems so... Good? Yeah, a 3/3 or 4/4 for this card is fine. It's a good card. Deck doesn't exist without it. 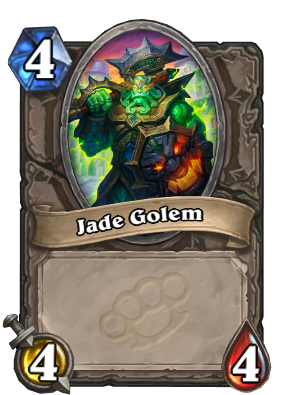 In my opinion, this jade golem mechanic isn't bad but can't stand against meta. Think this jade things against Midrange Shaman or Midrange Hunter. 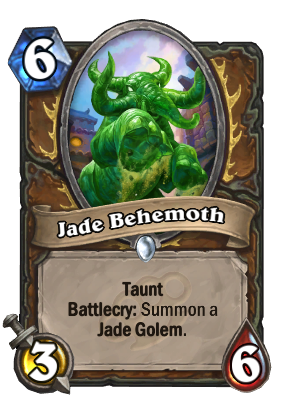 They will drop really huge drops but you'll drop only 3/6 taunt + probably 3/3 jade golem. Think against Savannah Highmane. You can understand me clearly. Actually I don't understand at all. This + a jade golem is not bad against a highmane. they already released them like 2 days ago. the first one is a 1 mana 1/1, second is a 2 mana 2/2. 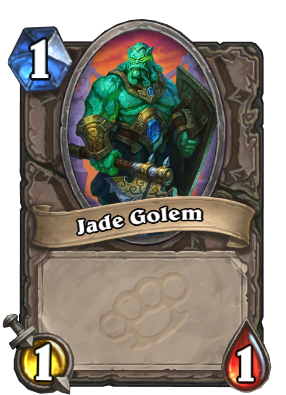 They are 1/1 the first time, 2/2 the second time, etc.... n/n where n is the number of jade golems played this game, including this one. In a jade deck it's actaully decent, pavel ran the 5/7 taunt at blizzcon so why not this card? hey, we are not pavel. he is the most beloved child of rngesus. we humble mortals need non-situational solid cards to play this game. Dark Arakkoa is a 0-rng card. And it was almost as good as his Babbling Book so it should in theory be INSANE for us. 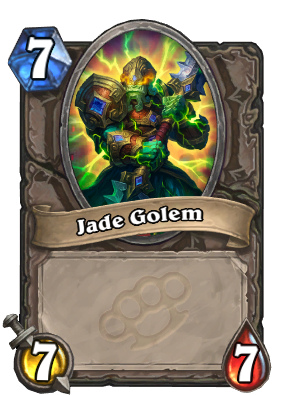 Meh, just ok, I am not so impressed on this card, it JUST works on a Jade Golem deck, but if not, its just useless, a 4/7 for 6 in separated bodies with a meh taunt, compared to other taunts, I don´t find it pretty usefull, but on a deck that can play with it, can be pretty powerfull. Also, it could have been better IF IT IS A BEAST BUT MADE OF ROOTS. Terrible. This is really not worth a spot in the deck, you just take current arcane giant druid add auctioneer and jade idol thats all you need. I mean that is true, but not many games go to fatigue and i wanna speed up the 1 mana 7/7 memes. You don't even need Auctioneer. You do realize the infinity golems will take a lot of time. Its a Nzoth level slow mechanic so speeding it by cycling while mainting board control is important. You will defiently have to ramp and draw ASAP. I am not sure Auctoneer is the way to go or some other quick cycling method. On the other hand the current druid is fine too but all just adding jade idol will do is guarantee you beat fatigue warrior maybe control priest, if they arent playing discover idol dragon. Yeah, but Auctioneer on it's own isn't that good in Druid, because by that point you likely already used up a lot of cheap spells and unlike Rogue you don't have good single-target removal or a way to generate Coins. And the current Druid is already starved for slots, trying to cram in extra 4 for Idols and Auctioneers is pretty hard. I mean I'll try, because playing Auctioneer on turn 10 with four consecutive Golems about 6/6 each and growing is pretty juicy, but I'm thinking just putting Idols in a good old Violet Teacher deck might be better because that deck fares better versus aggro. Wait which of the 4 common druid cards is actually the rare? 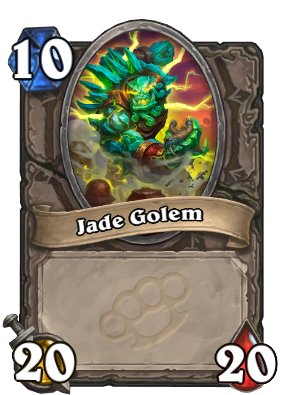 EDIT: They just updated the Jade Idol to rare status.